Floral Arrangements and Flower Decoration. 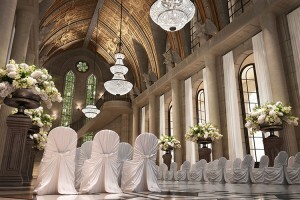 Flowers can be an expensive factor when planning a wedding budget. Most brides spend nearly 8 to 10 percent of their budget on flowers. If you’re a bride who’s on a tight budget, you can cut costs down by making your own floral arrangements. It’s easy, inexpensive, and fun. Read the step-by-step guide on how you can create table arrangements for your wedding. Floral foam is a spongy foam that’s great to use for flower arrangement. Instead of using water, the foam acts as a sponge and soaks up water to keep the flowers fresh. 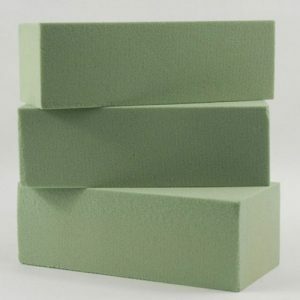 Floral foam comes in a variety of shapes and sizes. 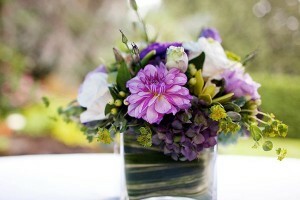 It’s also great because it gives you a lot of control to arrange the flowers exactly how you want. To use floral foam, it must be pre-soaked, measured to size, and taped securely to your vase. The first step is to soak the floral foam. You don’t want to submerge it because this will create air bubbles. Instead, drop it in the water and let it soak on its own. As it soaks, it will sink. The process takes about 15 to 20 minutes for it be completely wet, and should last for up a couple of weeks. Once it has been soaked, you must shape the floral foam to the vase. To shape the floral foam, simply place the vase face down against the foam and press down to make an imprint. The next step is to use the impression as a guideline to cut away the excess pieces. After you cut it, push the foam into the vase. It should fit tightly, and sit about two inches above the lip of the vase. Sometimes the flowers can pull the foam out of the vase, so you want to secure it by placing floral tape across the top. 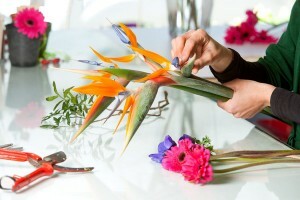 You will then need to prepare your flowers by cleaning the stems. Remove any thorns or leaves. 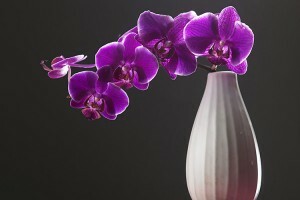 Just as you would prepare flowers for a vase with water, cut the stems at an angle. This allows the water from the floral foam to get into the stems. Start trimming the flowers to an appropriate length. Keep in mind that it’s better to start at a longer length rather than cutting it too short. After you’re happy with the height you are ready to start placing them into the floral foam. After shaping and placing the foam in the vase, begins the fun part: arranging your flowers. You don’t need to follow a particular pattern. Be creative, and simply place the flowers in the foam where you think would look best. Begin with the heavier pieces or greenery first. It’s a good idea to start from the middle of the foam and work your way out. This will help form the structure of your arrangement. When placing the flowers in the foam, the stems should be at least an inch into the foam. You’ll also want to push the flowers in as straight as possible. Otherwise the stems could tangle up with one another, and won’t be able to get to their water source. After you’ve finished putting the greenery in, continue with the flowers. Do this until the tape and foam is completely covered and you’re satisfied with your floral arrangement. The last word on your Floral DIY Project. You don’t need to have a large budget to create a floral table arrangement for your wedding. By making your own, you will cut costs down and get exactly what you want. All you need are the flowers of your choice, a vase, and floral foam. It’s truly that simple.